Everyone needs a dark phase. Bastion gets its own evil streak in the latest skin revealed for the Overwatch Storm Rising event, Gwishin Bastion. The event launches on April 16. 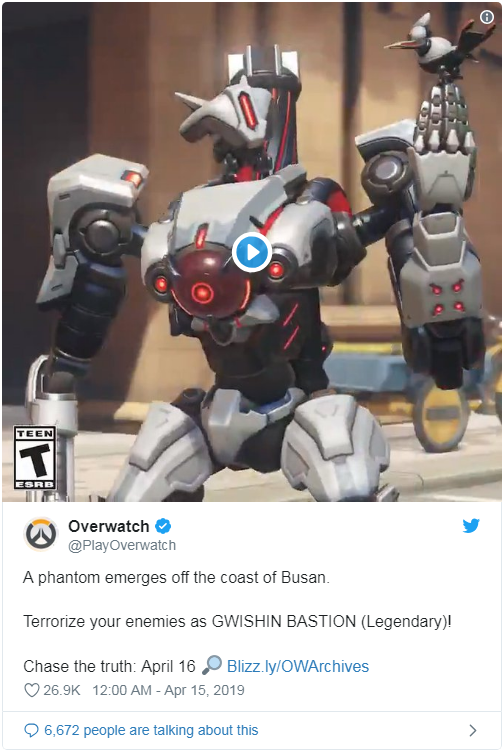 Gwishin Bastion is a legendary skin released for the event that gives Bastion a total overhaul. The normally peaceful omnic is given a sharper, more dangerous look. Even its canary companion, Ganymede, is turned into a tiny omnic. The grey, black, and glowing red design is inspired by the Gwishin Omnics who routinely attacked South Korea and China in the Overwatch universe. In Overwatch lore, the omnics are artificially intelligent robots that were initially created to increase economic production. They developed the ability to become self-aware and many eventually rebelled, attacking human cities in what was called the Omnic Crisis. The first Overwatch Archives event, Uprising, revolved around defeating the omnic uprising in King’s Row. The next Overwatch Archives event, Storm Rising, runs from April 16 to May 6. This event revolves around a mission in which Tracer, Genji, Winston, and Mercy have to track down Talon’s omnic mastermind, Maximilien. Seven skins have been revealed so far, including Formal Soldier: 76 and High Roller Wrecking Ball. Two more remain, according to the official Overwatch Archives site.